It's going to be another great season in the girls 400 meters. The event show a ton of talent during the indoor season that should make for a thrilling outdoor season. The top returner based on time is Neumann Goretti's Mykala Perry. Last year, Perry went 54.94 to win the PCL title before going on to win state gold in AA. Perry was second at indoor states. She'll be the one to beat this spring once again. In AAA, we'll get a good matchup between a number of the state's best. Reigning state champion Hunter Robinson is off at Tulane, but there is a wealth of strong returners. Talitha Diggs of Saucon Valley is the top returner on states finish (second) and time (54.95) in AAA. 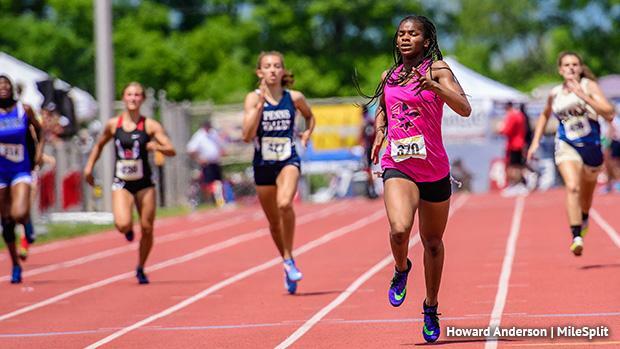 She got even better during the indoor season, winning the state title and then running 54.21 at indoor nationals. But she'll get a good race from Cheltenham's Bria Barnes, who came on very strong at the end of indoors. After taking fourth at indoor states, Barnes roared into indoor nationals, running 54.05, the second fastest indoor 400 time in state history. Other AAA state medalists back this year are North Penn's Natalie Kwortnik (fifth), Belle Vernon's Hannah Seitzinger (seventh), and Penn Wood's Elicia Moore (eighth). In AA the returning medalists after Perry are Penns Valley's Isabella Culver (second), Bloomsburg's Sage Harmon (third), Everett Area's Kaitlyn Maxwell (fourth), Shade's Lorna Speigle (sixth), and Mastery Charter - Pickett's Danae Plowden. Three other returning girls ran in the 56 second range last outdoor season: Coatesville's Arianna Eberly and Porsha Miles, and Warwick's Leah Graybill. Both Eberly and Miles were apart of Coatesville's state championship 4x400 last spring. Miles was sixth at indoor states. The one to watch in the independents is George School's Sanaa Hebron. The freshman went 55.04 this winter and placed third at the indoor state meet. Look for the ninth grader to make noise this outdoor campaign. Watch an interview with Diggs from the indoor state meet and check out the top 1000 returners in the girls 400 meters.